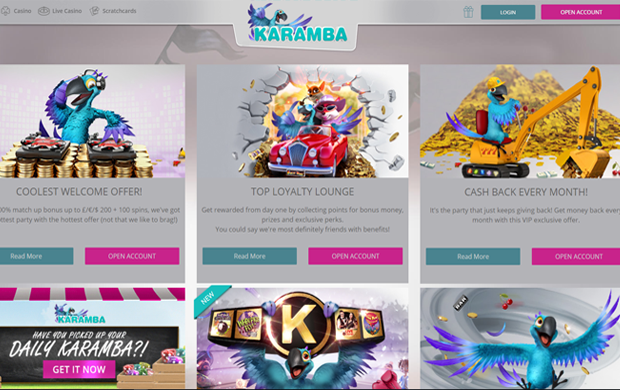 Karamba casino is a popular online casino that was established in 2005 and rebranded in 2015. It has an appealing outlook and exclusive games to offer. The casino maintains a high level of customer privacy with data encryption technology. Additionally, it is licensed by renown authorities like UK and Malta. The games load fast and smoothly on both desktops and mobile devices. 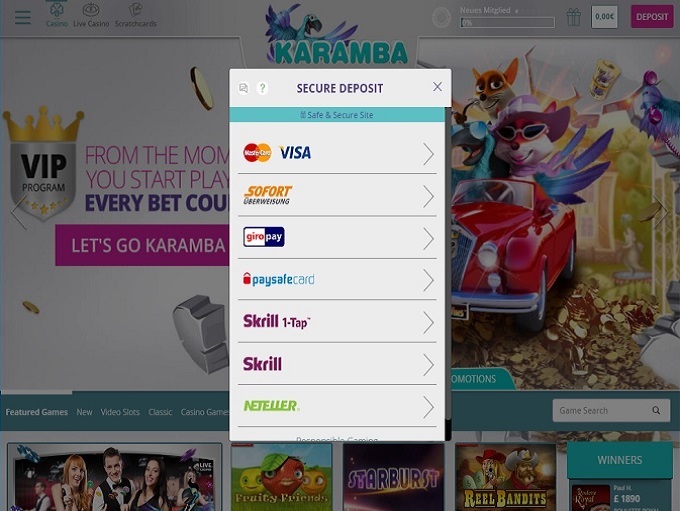 Karamba is powered by reputable software brands like NetEnt, Amaya, and QuickSpin. You will be treated warmly by their support team agents who are available 24/7. 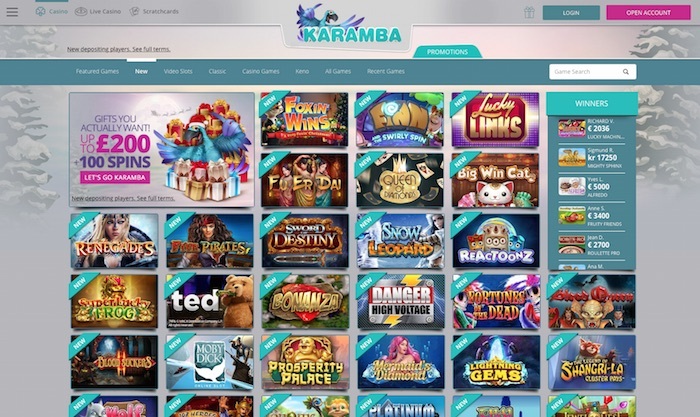 All games at Karamba are designed with cutting-edge technology which enables them to run on different platforms like mobile phones and desktop computers. In fact, the games are available in instant play mode, meaning there is no need to download any software. Players will find exclusive games from Net Entertainment, Lightning Box Games, Amaya Gaming, NextGen gaming, QuickSpin, Evolution Gaming, and Thunderkick. With reputable software providers powering it, you expect nothing but a whole collection of exciting casino games. Their game library comprises of over 200 different casino game variations. As aforementioned, all games are available instantly via mobile and desktop browsers. The games include slots, scratch cards, table and cards, video poker, progressive and live dealer. Slots: Starburst, Legacy of Egypt, Mighty Sphinx, Redeem the Dream, Fruity Friends, Bakers Treat, Archangels Salvation, Rainbow Charms, Reel Bandits. Scratch Cards: Magic Spinner, Lucky Machines, Cash Rumble x10, Poker King, Scratch n Roll, 3 Rocks and Ocean Pearls. Progressive Jackpots: Cosmic Fortunes, Jackpot Jesters, Jungle Jackpot, Dolphin Gold and Wish Upon a Jackpot. Karamba mobile app has a beautiful design which echoes its desktop version. The menu and other gaming options are orderly arranged, making it is to navigate the site. The app loads fast and with no glitches at all. The application software can be downloaded on any mobile phone including iOS, Android, Windows, and Blackberry. You will be thrilled with over 100 great games from NetEnt, WMS, among other developers. As well, the app supports live gaming. Bonuses and promotions are the areas you will find Karamba leading at all times. The casino offers warm welcome bonus package and free spin promotions. All new players are entitled to 100% match up bonus up to £200 plus 100 free spins. Additionally, there is a Loyalty program where players can rise through different levels of Bronze, Silver, Gold, Platinum, Premium, and Prestige. VIP players enjoy benefits like personal account manager, VIP Live Tournaments, and Monthly Cashbacks. Being a reputable software provider, Karamba casino maintains top-notch security for all their customers. They have licenses from trustworthy authorities like the UK Gambling Commission (UKGC) and Malta Gaming Authority. Also, the casino uses 128-bit Secure Socket Layer (SSL) data encryption technology to ensure that security of financial activities and other personal information from leaking to third parties. Furthermore, all games use a random number generator software to ensure that the results are fair and random. Safe and Secure payment options are important for any gambling platform. Karamba is strict when it comes to protecting their customers. Players can withdraw or deposit their funds through different ways like Visa card, Mastercard, Paysafecard, Maestro, Skrill, Bank Transfers, Siru Mobile, Poli, UseMyFunds, iDEAL, ecoPayz, Neteller, FundSend, and Trustly. Karamba is an international casino operator. The casino supports ten different languages including English, Suomi, Norsk, Svenska, Portuguese, Spanish, Deutsche, French and Italian. Players can contact support agents any time via live chat, phone call or email. Alternatively, the FAQs section is equipped with some of the most common topics for quick access. In conclusion, Karamba casino is a great gambling platform for both beginners and experienced gamblers. Other than the appealing interface, the games and bonus offer will blow your mind. The mobile platform, like its desktop version, has exciting games and special winning features.